We all hear voices in our head when it comes time for dessert. The sinner legitimizes a hearty helping of chocolate cake; the saint calculates carbs and hours spent working off said chocolate cake. Lucky for us, Elisa Testone whips up decadent treats and guilt-free delights at her perfectly-named bakery, Sinners & Saints Desserts. Slightly set back from the busy stretch of The Linc, just north of Washington Blvd., Sinners & Saints offers a variety of options, so you can balance a giant slice of bourbon chocolate pecan pie with a mini gluten-free red velvet cupcake. (Gluten-free means calorie-free, right?) One thing we can guarantee is that gluten-free has nothing to do with the rich, decadent taste in every blissful bite. "If you tell me my desserts are good for gluten-free, I don't consider that a compliment," says Elisa. "I want you to enjoy a dessert the way a dessert should be enjoyed." Elisa and her partner Dustin Hodges took over this commercial kitchen in August 2011, and though it may be hard to believe that one of the sweetest spots in Venice is just now registering on everyone's radar, it's probably because they've slowly grown their business along with the offerings in the display case. At first, Elisa explains, no one knew what to make of their black, red, and white storefront. The name and the questionable location on the gritty thoroughfare drew all sorts of assumptions, from tattoo parlor to fetish boutique. But once customers ventured inside, they discovered a haven of one of the greatest pleasures of all - chocolate. Using recipes passed down from her mother combined with her knowledge of gluten-free and sugar-free recipe making, Elisa has created a variety of treats for every type of craving, and if she doesn't have what you're looking for, just ask. She rocks a custom order. 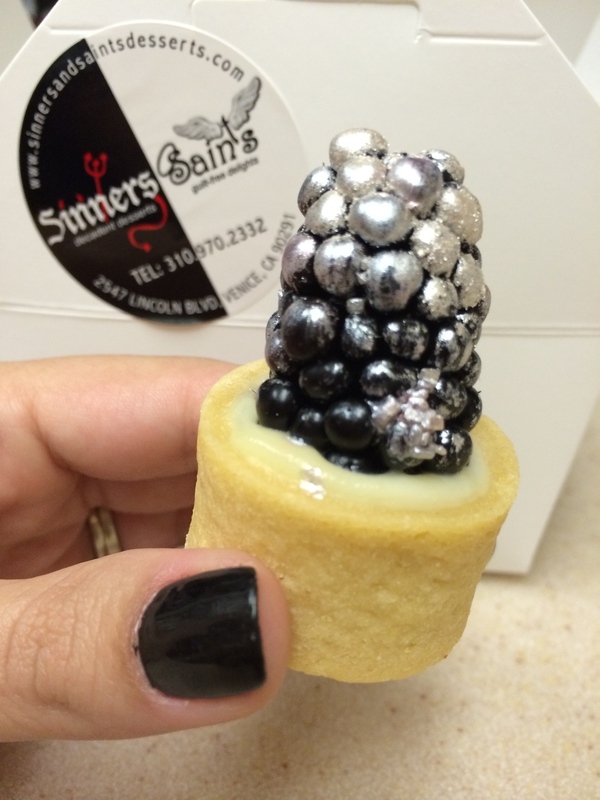 With pie season upon us, Sinners & Saints offers all the seasonal favorites. We mentioned that bourbon chocolate pecan. Take home one of those along with a pumpkin pie topped with a spicy chip of housemade pumpkin brittle – pumpkin brittle! Or, grab a slice and sit a while inside the cozy shop with a hot Nutella latte. Also good to know ... we hear that the new Brick Smokehouse, which takes over the Brickhouse Kitchen nightly, is going to be serving up some sinfully delicious pies for dessert. Happy holidays indeed.